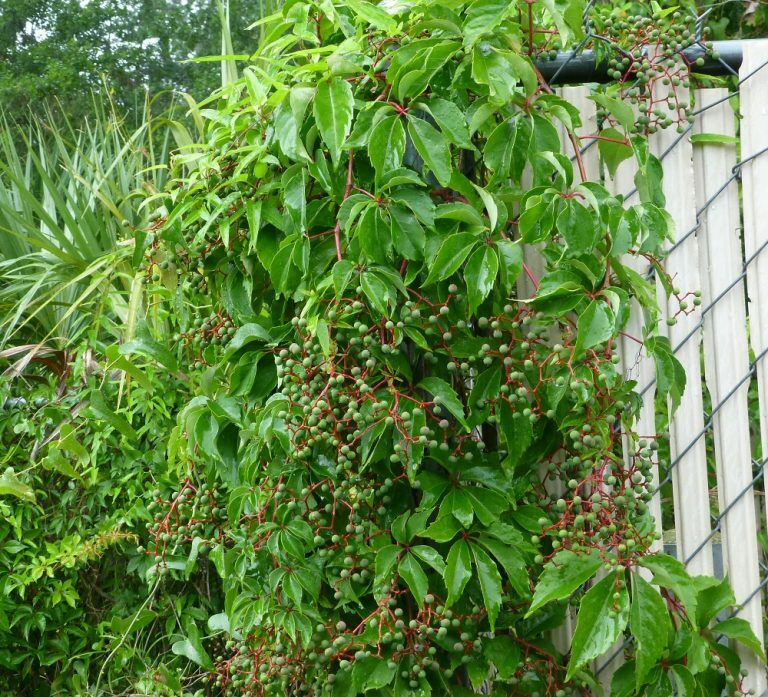 A woody, evergreen, high-climbing perennial vine. The leaves are opposite, compound (two leaflets), oblong to lanceolate with entire margins. 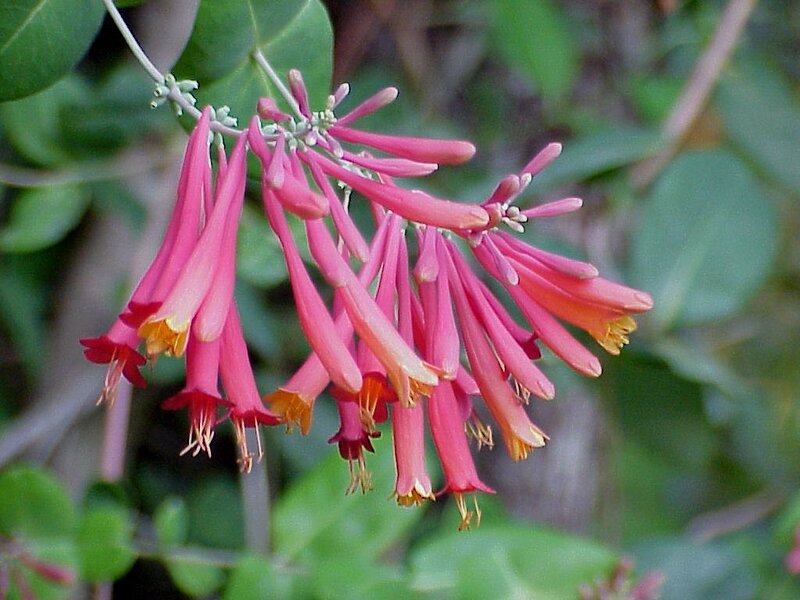 The flowers are large, tubular, and reddish-orange and yellow, and are a nectar source for hummingbirds in the spring. It is found in woodlands, thickets, and floodplains. It grows in part-shade to full sun with average to moist soils. 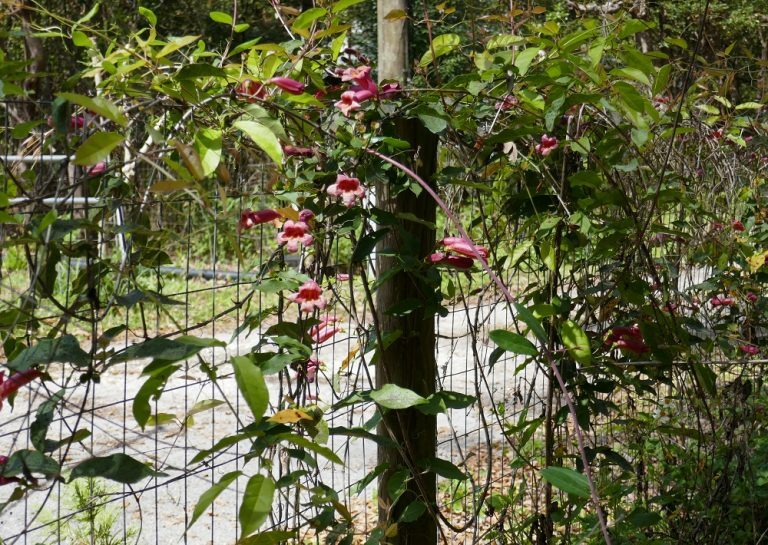 A perennial, deciduous, vine that can reach 3 feet or more in length. It tends to stay prostrate and trailing, but will climb if given a support. It readily re-seeds itself wherever it is planted. The leaves are alternate, with three leaflets that are oblong to elliptic. 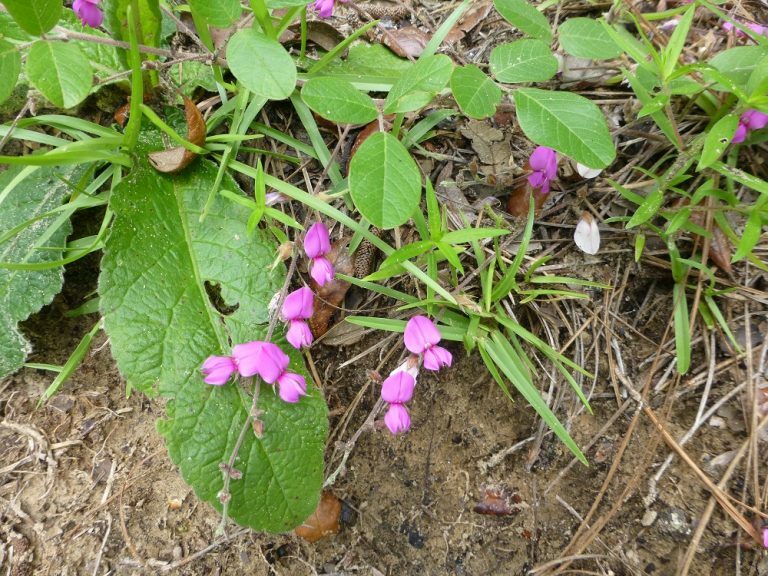 The flowers are small lavender pea-shaped and appear all year. It is found in hammock edges, pinelands, and sandhills. In the home landscape it grows in part-shade with average moisture. Small butterflies and bees use the flowers as a nectar source, and it is a larval food for the cassius blue butterfly. A woody, evergreen, vine that climbs high into the trees. The leaves are opposite, simple, entire and lanceolate. Yellow flowers are tubular with flared petals, and appear in late winter and spring. 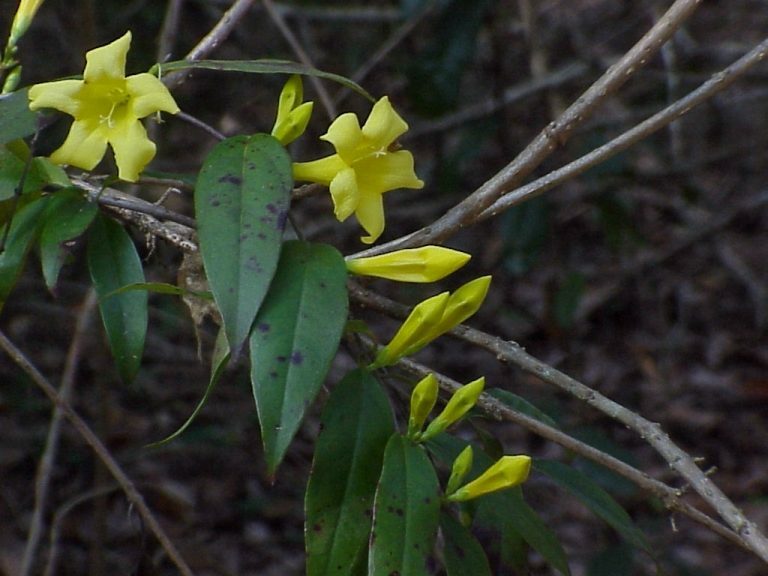 It is found in woodlands, pine flatwoods, and disturbed sites. 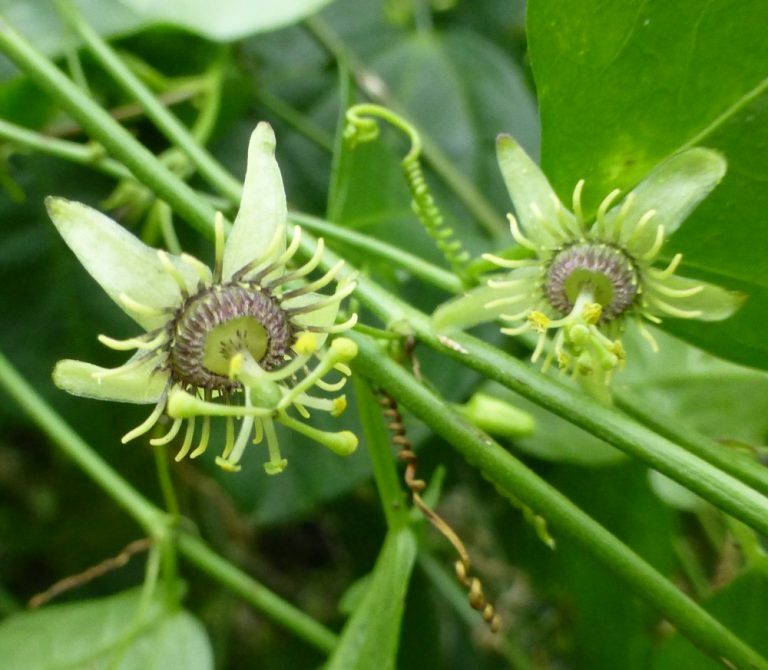 All parts of this vine contain a toxic alkaloid, gelsemine, and should not be consumed. The sap can cause skin irritation and the flowers are said to be toxic to honeybees, but not native bees. Depsite its downfalls it is one of the first and most colorful of the spring blooming native vines. 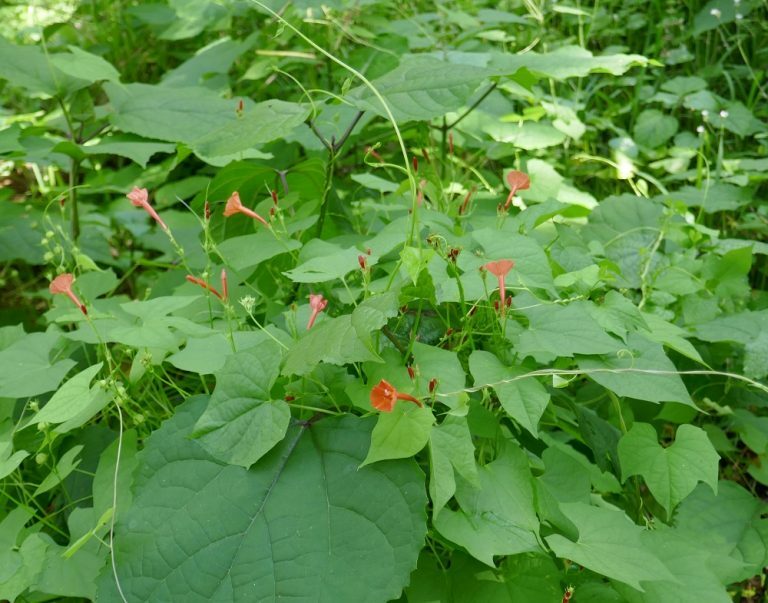 An annual, deciduous, vine with small red trumpet shaped flowers. It climbs by tendrils so it does need a support, however, it does not spread very wide and generally only needs an area of around 4 feet. The flowers are a nectar source for hummingbirds and butterflies. It grows in full sun to part shade with average moisture. Blooming occurs in summer and fall. It will readily re-seed around the area where it is planted and the seedlings can be pulled up and transplanted or put into pots. An evergreen, perennial vine that tends to clambor as well as cliimb. The red tubular flowers appear in the spring and summer. The flowers are a nectar source for butterflies and hummingbirds, and the fruit is eaten by a variety of songbirds and small mammals. A deciduous vine that creeps and climbs. It is found occurring naturally in hammocks and wet woodlands. It grows in full to part shade with an average to moist soil. The flowers are used by many pollinators and the small dark fruit is eaten by a variety of birds and other wildlife. In the fall the leaves turn a crimson red. The sap can cause skin irritation in some people. A trailing vine that will climb by tendrils if given a support, but generally prefers to spread along the ground by underground runners. 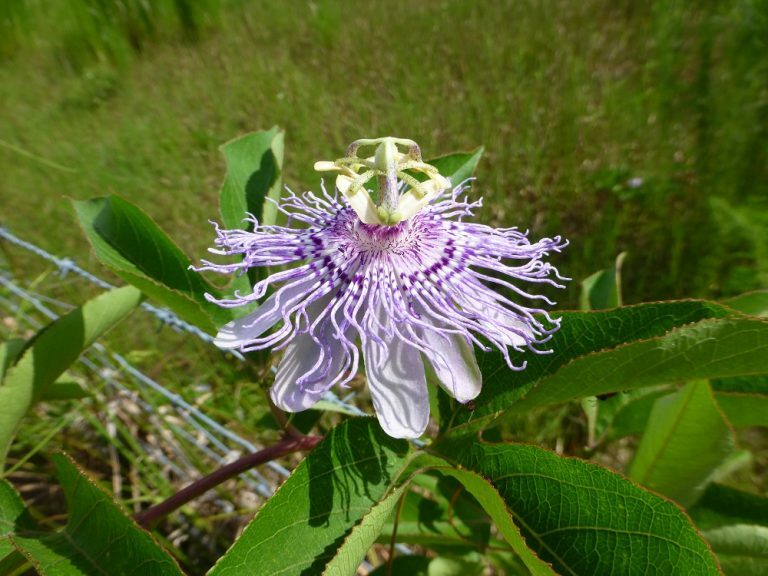 Large purple flowers appear in the spring, summer and fall and provide a nectar source for bees and other pollinators. It is a larval food for the zebra longwing and gulf fritillary butterflies, favored more by the gulf fritillary because they are both sun lovers. A perennial, deciduous, vine climbing by tendrils. The leaves may be entire to three lobed, up to 4″ in length. The stem becomes woody & winged with maturity. The flower sepals are long & greenish white and resemble petals, which are absent. It blooms all year. The fruit is a small berry, green turning to purple-black at maturity. It grows in the part shade of hammocks & shell middens. It is a larval food for the zebra longwing and gulf fritillary butterflies. A clambering perennial vine. There are many species of greenbriar and some are evergreen and some deciduous. Some have thorns and some do not. Small fragrant flowers appear in the spring and summer followed by small fruit that is eaten by a variety of wildlife. It can be invasive in small areas, however if you have the space the thickets formed provide excellent nesting habitat for songbirds. Tender new shoots are edible and can be used in recipes that call for spinach. A perennial, deciduous, vine that attaches itself with aerial roots. 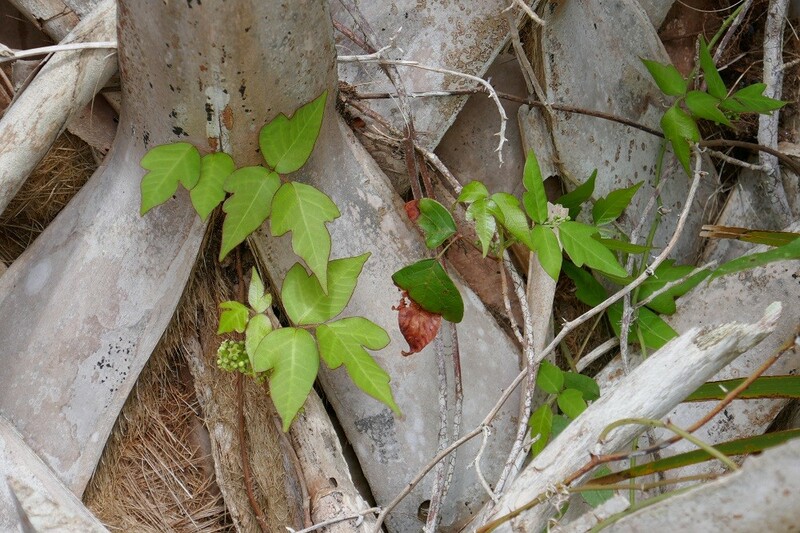 It is commonly confused with Virginia creeper, but poison ivy has three leaflets and Virginia creeper has five. The mature stem found climbin upon tree trunks can usually be identified by the hairy rootlets. The sap is a major skin irritant. 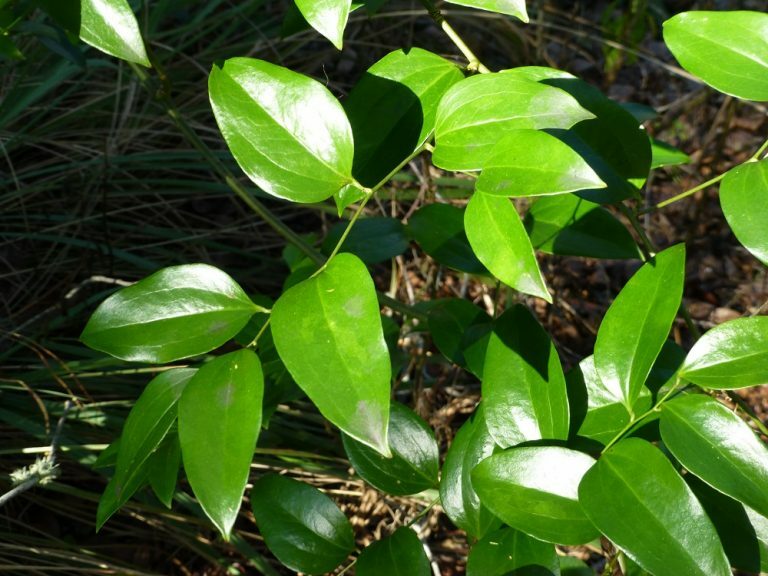 A perennial, deciduous, woody vine with heart-shaped and coarsely toothed leaves. Small flowers appear in the spring and summer. The grapes are edible and prized by wildlife. It can become invasive, however can be kept in check by pruning the vine as well as the root suckers. A perennial, deciduous, woody vine with heart-shaped and coarsely toothed leaves. Small flowers appear in the spring and summer. The grapes are edible and prized by wildlife. 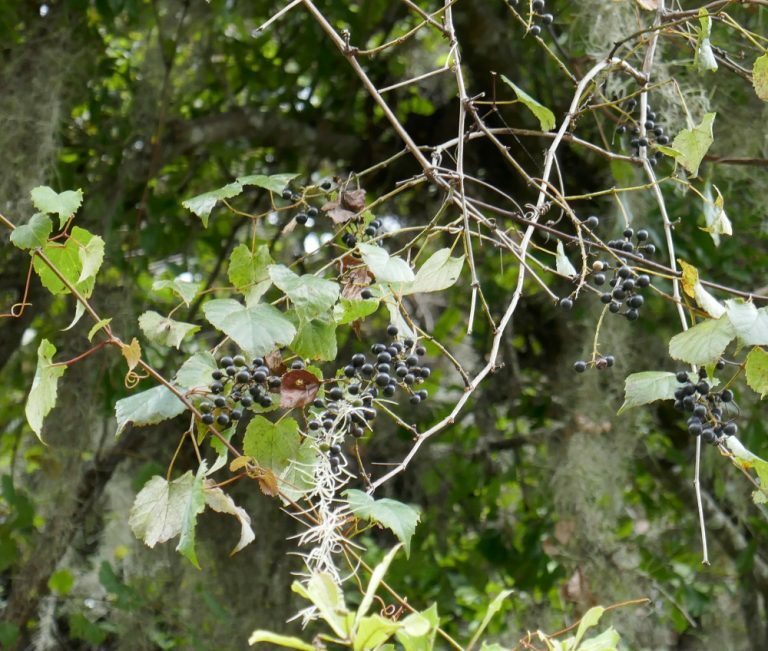 It is distinguished from the muscadine grape through leaf identification. 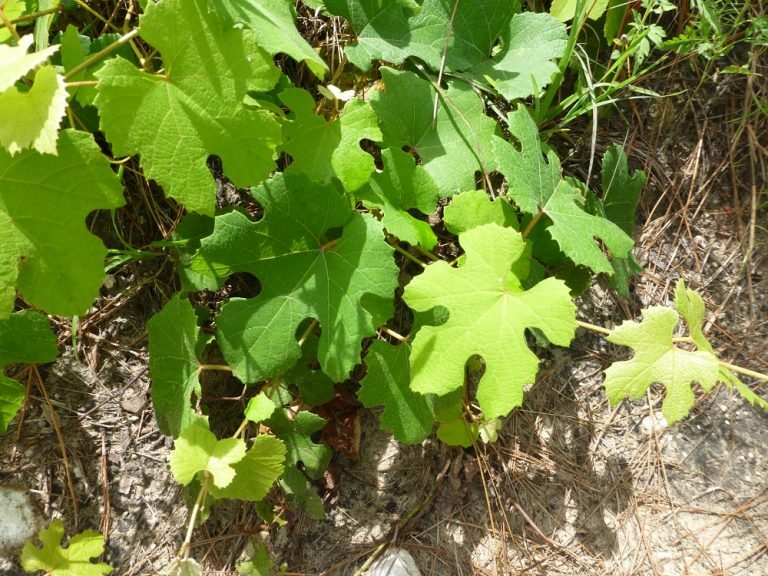 Calusa grape has white or rusty hairs on the undersides of the leaves and they are mostly deeply lobed.